It occurred to me today that the Krispy Kreme Challenge is just a dozen days away. To countdown the days, I’ll be posting daily pictures comparing a dozen doughnuts to a dozen pieces of other breakfast food. Unfortunately, I ran out of typical breakfast foods during my photo shoot, so you may end up seeing dog biscuits on Day 9. Today, we have a dozen Krispy Kreme doughnuts vs. 12 pieces of Old Fashioned Quaker Oats. 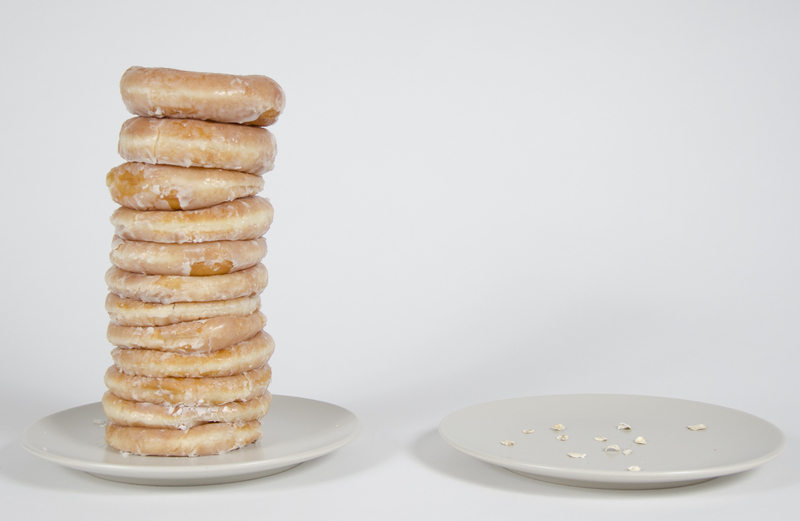 If you zoom in and cross your eyes, you might actually be able to see those oats in the shadow of that doughnut tower. I’m not good enough at math to figure out the caloric value of 12 pieces of oats, but you can bet it’s nowhere near the 2,280 calories in the doughnuts. Oh, and in case you’re wondering, no, I didn’t eat all those doughnuts. Great idea . . . great writing . . . and, especially, a great visual!